It&apos;s Christmas time in the city of Boston, and that means we&apos;ve decked the halls in our holiday finest. If you&apos;ll be visiting us over the next few weeks (and may I be the first to welcome you to our fair city and on its behalf, wish you and yours a happy holiday), be sure to check out our festive Christmas trees. That&apos;s right I wrote "trees" with an "s," as in we&apos;ve got more than one to show off to you. You could start your tree tour near the Boston Public Library and marvel at the lovely tree presented by the Friends of Copley Square. 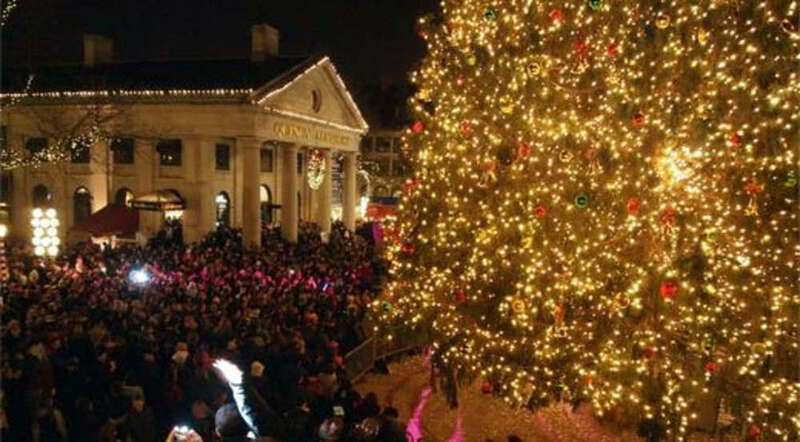 Be there on Monday, December 2 at 5:30 p.m. when Mayor Thomas M. Menino will kick off the season and officially light the tree. Santa will join in the celebration, and the Fairmont Copley Plaza will host a complimentary reception following the lighting. While you are in Copley Square, look up at the Prudential Center (you can&apos;t miss it). While it won&apos;t have a humungous tree, the top of its humongous building will be lit a different color each evening of the holiday season for 31 Nights of Light. Each day will be dedicated to a different community organization such as the Special Olympics and the Alzheimer&apos;s Association. Representatives from the groups will flip the switch to illuminate the building, and there will be live music and presentations each of the 31 nights. Head up towards the Boston Common. (If it&apos;s a bit chilly, you might want to warm up with some hot chocolate along the way.) The city&apos;s (and the nation&apos;s) oldest public park is where you will find Boston&apos;s official holiday tree. Per tradition, the 47-foot white spruce is a gift from Nova Scotia. It will have its kick-off lighting ceremony, again with Mayor Menino and Santa (two busy dudes! ), on Thursday, December 5 at 6 p.m. There will also be a menorah at the Common in celebration of Hanukkah. You might want to stick around for some ice skating at the nearby Frog Pond. For the final stop on the Christmas conifer crawl, make your way to Faneuil Hall Marketplace. An 80-foot blinged-out holiday tree (the largest in the Northeast) awaits you. But hold on to your Santa cap, because each evening through January 5, the Marketplace will also present Blink! A Light & Sound Extravaganza. Synchronized to holiday music featuring the world-famous Boston Pops, the show features 350,000 LED lights. Talk about making spirits bright!